Whatever your power protection needs or requirements, we have the experience, knowledge and solutions to help stretch your budget without sacrificing performance or reliability in the process. Our industry leading 10 step Performance Guaranteed refurbishment process is second to none. It ensures the highest degree of performance and reliability for the power protection solutions we offer. We focus all of our processes on our valued customers. The better we understand the pressures our customers face, the better we can serve their needs. The RefurbUPS sales, service and support teams will go the extra mile to earn your trust and your business. We also provide an extensive online library of UPS battery replacement video tutorials and FAQs to further aid our customers. Our PowerSWAP programs are specially designed to save you time, money and resources. Helping revitalize your mission critical battery systems and restore your protected UPS system runtime, without sacrificing performance or reliability in the process, is our mission. It’s that simple! We know that having a warranty is important, but even more important is being able to trust that warranty is your time of need. RefurbUPS offers a 90 day advanced replacement warranty on all Performance Guaranteed UPS products, as well as a 1 year replacement warranty on new replacement UPS battery solutions. Like most companies and institutions, your IT teams are overwhelmed and always short on resources, trying to do more with less. Our experienced power protection experts can tailor a UPS fleet management solution to meet your needs, save time and improve your bottom line. RefurbUPS will purchase surplus or excess UPS equipment and offer you fair value. Whether you’re upgrading your power infrastucture or downsizing and consolidating, we can help you maximize your value on your existing UPS equipment. Unlike many of today’s UPS manufacturer trade-in programs, we pay cash directly to you with no restrictions on how you spend it. 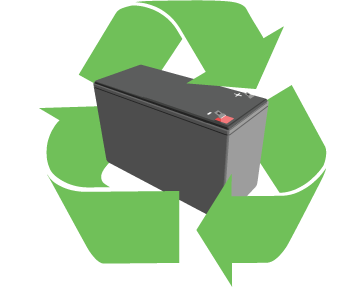 RefurbUPS offers environmentally responsible UPS battery recycling free of charge.